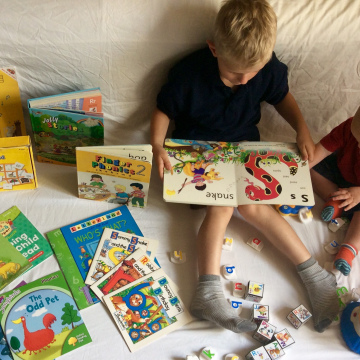 We are delighted that the lovely Janna, who regularly visits all three of our nurseries introducing Fun Phonics to the children, is our guest blogger this month. Here she tells you a little more about herself and what she does. Fun Phonics came about by accident when my son started reception at St Mary’s school in Pulborough. As a parent and qualified primary school teacher, I found myself listening to and helping parents with their concerns about their children’s education. It became apparent to me that many parents were confused about phonics. Consequently, I hired out a village hall and set up a free workshop for parents to actively learn about phonics through games and discussion. I created a Facebook page to promote the event and thus Fun Phonics was born. Before long, I had interest from many local pre-schools. First Steps were among the first nurseries to ask me to work with their children. I devised a short, but active, phonics session for pre-schoolers, and the children loved it! I use a range of techniques to teach the children including sign, rhyme, alliteration, song, dance and of course PLAY. So how do I help your children? I always begin by engaging the children with sounds. I play a variety of sounds and ask the children to identify them. During these sound sessions, the children have been to the ocean and the forest, they have listened to the sounds of birds and insects and they have drummed on saucepans and rattled their shakers. I have developed their ears to hear subtle differences in sounds and this has laid the foundations for their early letter sound recognition. I have become famous for my song, ‘what’s in the bag?’ https://youtu.be/A9jl4JUGHrk The children all sing along and put their hands up eagerly to discover what is inside the bag each week. The small objects inside the bag are always linked to the letter sound of the week and the children are becoming experts at hearing the first sound in many words. The weekly activities, nursery rhymes and stories are always linked to the sound of the week. The children have looked for snakes in the grass, they’ve had tea with tigers and zoomed cars down race tracks, among many other carefully planned activities. I enjoy watching all of the children grow and develop each week. Thank you Janna. We at First Steps have no doubt that Fun Phonics plays a big part in helping our children transition smoothly from pre-school to reception and, watching the reaction Janna gets when she arrives each week, shows just how much the children enjoy her sessions! If you’d like to contact Janna or find out more about Fun Phonics, take a look at her Facebook page https://m.facebook.com/funphonics15/ for fun and friendly help and advice. Janna urges no one to push children to read, but knows there are loads of fun ways to approach it through play and storytelling. You can also watch Janna’s ‘what’s in the bag?’ YouTube videos with your children https://youtu.be/A9jl4JUGHrk which are useful guides for parents. Janna holds regular phonics workshops for parents in many different venues and you might like to subscribe to her website http://www.funphonics.education/ to receive notifications about forthcoming events. If you would like to be a guest blogger for First Steps, please get in touch with lucy.oldham@chichester.ac.uk. We’d love to hear from you.